This weekend is not only your last chance to polish off your bear-hunting on The Big Sleuth public art trail across Birmingham and surrounding areas but a bear-illiant way of getting all-important violet light. Read our expert Dr Nicola Logan’s view on why getting outdoors for 90 minutes a day may reduce children’s risk of developing short-sightedness. Most people think of myopia – the medical term for short-sightedness – as an inconvenience because the blurred vision it causes is easily corrected with glasses or contact lenses. Yet, short-sightedness is a global public health problem, according to Aston University’s Dr Nicola Logan, a senior lecturer in the School of Life and Health Sciences optometry department. This is because a myopic eye is a longer eye and so the light sensitive part at the back of the eye is stretched, which can lead to a number of eye diseases in later life, such as glaucoma, maculopathy and retinal detachment. Experts are also concerned because the number of people with myopia is increasing. Research suggests that by 2050 it will affect half the world’s population. Myopia normally develops in children and increases in prevalence and amount during the teenage years. About 30 per cent of teenagers in the UK have myopia, and in some East Asian countries around 80 per cent of teenagers have myopia. Our visual environment plays a role in myopia development. Lifestyles have changed significantly over the last 50 years, with greater time being spent indoors on computers, tablets and smartphones. “The LEDs and fluorescent lights often used in our homes and schools contain little violet light, and violet light does not pass through materials such as the UV-protected spectacles and the glass in windows,” explains Dr Logan. “Research suggests that it is lack of time that children spend outdoors that seems to trigger myopia development. “The impact of these levels of myopia on all areas of society is enormous due to the cost of eye examinations, glasses and treatment of eye disease. The reasons why myopia develops are not fully understood; the prevalence has increased too quickly to be explained solely by genetics. “At Aston University, we are looking for ways to prevent myopia, or, if it has started, at ways to slow its progression. “If myopia has already developed, then we can slow progression by about 50 per cent by using different designs of contact lenses or a low dose of atropine eye drops. Spending more time outdoors may also help slow down progression of myopia in children. The Big Sleuth public art trail launched on Monday 10 July 2017 and runs for 10 weeks, culminating on Sunday 17 September. It follows the phenomenal success of The Big Hoot in 2015, which raised over £500,000 for the Birmingham Children’s Hospital Charity. The campaign focuses on tracking down 237 individually-designed sun bear and bear cub sculptures across Birmingham and surrounding areas including Sutton Coldfield, Solihull, Sandwell and Resorts World. The campaign trail is designed to promote getting outdoors and exercising as a family, whilst also enjoying tracking down the bears and fundraising. Aston Medical School has its own bear on the trail – Ed The X-ray Bear – located on the Aston University campus. X-ray Ed, was designed by Birmingham artist and former radiographer Anne Guest who chose her X-ray theme to highlight the work of Dr John Hall-Edwards who pioneered the use of X-ray in surgery at Birmingham General Hospital over 120 years ago. The hospital building is now the home of Birmingham Children’s Hospital. If there was such thing as National X-ray Week (which there currently isn’t… pfft! ), it would surely be this week. 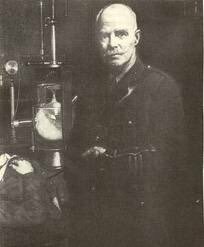 15 August was the day John Hall-Edwards, the Birmingham-born pioneering radiographer, died. That was 91 years ago but he left an incredible legacy and as readers of my blog know, Dr Hall-Edwards was the inspiration for my fabulous self. I’m even named after him, Ed being short for Edward. Geddit? And readers will recall that my creator, Anne Guest, was once a hospital radiographer which inspired her designs for yours truly. In 1896, Dr Hall-Edwards completed a hat-trick of amazing things in the history of radiography. First, he took one of the earliest X-rays which was used to help direct a surgical operation, then he took one of the first-ever X-rays of the human spine and he followed that up by giving one of the earliest demonstrations of this breakthrough science on Hodge Hill Common, Birmingham. This led to the doctor getting a very important job – Surgeon Radiographer at the Birmingham General Hospital and several other local hospitals – the Orthopaedic, Children’s and Eye hospitals. He was head of all the X-ray departments. The Birmingham General Hospital in Steelhouse Lane is no more, but the building is home to Birmingham Children’s Hospital. I think that’s a pretty cool link to The Big Sleuth which is all about raising money to help poorly children being treated by that hospital. I’m so proud to be promoting such a worthy cause! Dr Hall-Edwards was born on Moseley Road, Kings Norton in 1858 and went to King Edward VI Grammar School. He might have been a student at Aston Medical School only it didn’t exist then so he studied medicine at Masons College in Birmingham. When he graduated, he became a local GP but his passion for amateur photography led him to develop an interest in X-ray, which had been discovered by Wilhelm Roentgen in 1895. The rest, as they say, is history, although the doctor’s pioneering work to understand X-ray imaging came at a personal cost. He had to have his left arm and the fingers of his right hand amputated after he developed cancer. His preserved left arm is now in the collection of the University of Birmingham. On a less gruesome note, you can see a blue plaque commemorating the doctor’s work at Birmingham Children’s Hospital – check it out on your bear hunt! Here on my comfy concrete perch, I see faces of wonder and amazement each and every day. Why? Well, just look at me. But hark! I’ve been briefed on some startling research that suggests my many visitors might be forgetting to fully cherish my rousing company because they’re too busy fiddling with their camera phones, distracted by their desire to capture me as a digital image to treasure for eternity… I presume? Clearly, this is an important issue. So pay careful attention to the words below of Dr Rob Nash, senior lecturer in psychology here at Aston, who has advice of how to awaken your senses to my presence… and other meaningful moments in life. Over the last few weeks, so many people have visited X-Ray Ed and his friends around the West Midlands, and have taken loads of amazing photos of all the different colourful bears. But have you ever noticed how people sometimes get so wrapped up with taking photos, they forget to actually enjoy the moment itself? Usually we take photos as a way of helping us to remember our experiences. But psychology research shows that taking photos of our experiences can sometimes make our memory worse, rather than better! In one study, for example, people visited a museum and during their tour they were told by a researcher to take photos of certain specific artifacts, and to just look at others. Later, these people took an unexpected test of how well they remembered the museum tour. The results were striking: people were less able to recall the artifacts they had photographed, than the artifacts they had only looked at! In some other research that was published very recently, participants again visited a museum. But this time one group of people got to choose what to photograph during their tour, rather than being told what to photograph. Another group of people, meanwhile, had their cameras and camera-devices taken away completely. The researchers found that the people who had access to their cameras during the museum tour, and who took photos, later had better memory for the artifacts than did the people without cameras. But there was a down-side… the people with cameras had worse memory for the audio guide that they listened to during the museum tour, which gave information about each of the artifacts. So, in this case taking photos seemed to help people remember what they saw, but it stopped them from remembering what they heard. In short, taking photos changes how we pay attention to the world around us. Sometimes, we might pay so much attention to operating the camera and lining up the shot, that we barely notice what we’re even taking a photo of. Other times, we might pay lots of attention to the things we want to capture, but as a result we ignore what else is going on around us. These attentional changes, in turn, mean that taking photos can affect what we’re able to remember about our experiences afterwards. So here’s the thing: whilst bears are always fuzzy, your Big Sleuth memories don’t have to be! Come and take a selfie or two with X-Ray Ed (and make sure to share them with him on social media! ), but don’t forget to put your camera away for a while and enjoy the moment too. Take in the scenery around Aston University campus, around Birmingham, and the wider West Midlands, and make sure you go home with a head full of fun memories rather than just a camera full of snapshots. Now that I’m a local celebrity (yes, that’s right, a local celebrity) it’s far from uncommon to see members of the public reach for their smartphones as they become intoxicated by my very presence. Smartphones have seemingly infinite uses, from taking a cheeky snap of a rather handsome bear… to sharing those valuable images with friends so they can join you in sheer marvel. But the rising ubiquity of these devices is creating some serious safety risks, as Aston expert Dr Jo Lumsden has been telling me. Do you use your smartphone while you’re walking? Have you ever bumped into something or someone because you’re using your smartphone? Have you ever had an accident because you weren’t paying attention to things around you when you were using your smartphone? If you have, you’re not the only one! The number of people being hurt while using their smartphones is on the up. People are reporting all sorts of injuries as a result of using their smartphones while walking; sadly, some people have even died as a result of walking out in front of traffic when using their smartphone. Researchers at Aston University have shown that people fail to spot one out of every five dangers around them when they are texting and walking . Another study has shown that children using smartphones take 20% longer to cross the street and look both ways 20% less often than if they weren’t using a smartphone and, as a result, are 43% more likely to be hit by a car . Almost ¾ of drivers say they have seen ‘zombie pedestrians’ step out into traffic without looking because they are so busy with their smartphones. In fact, as many as 17 car accidents a day are likely the result of pedestrians who are not paying attention when they go to cross a road . When people try to use their smartphones while they are doing other things – like walking or crossing the street – they are said to suffer from ‘divided attention’ or ‘unintentional blindness’. In other words, they can’t concentrate properly on two things at once, and normally their smartphone wins the battle for their attention, which can prove to be very dangerous. Researchers in the Aston Interactive Media (AIM) Lab at Aston University are investigating new ways to interact with smartphones so you don’t have to divide your attention between your smartphone and the world around you; they are also developing new methods to test how safe smartphones are to use when out and about. Avoid walking and using your smartphone if at all possible. Stand still, in a safe place, out of people’s way to use your smartphone. Turn down the volume in your headphones so you can hear what’s happening around you. Only use your smartphone if you have checked it’s safe to do so first. Never cross the street while using your smartphone. I decided to catch up with Anne Guest, the visual artist that designed and created me to find out more about my design and her work. Me: Hi Anne. It’s great to see you. I’d like to start by asking: why did you make me all boney? Anne: I wanted to link the bear to something in Birmingham and the first X-ray taken for clinical use in UK was taken in Birmingham by John Hall Edwards in 1896 at the General Hospital. I might be a bit boney, but I’m a bit of a heffer too. Did my size cause any problems when you were painting me in your home? I didn’t have to manoeuvre you much, you were central in the room so I could move around you, and used a step ladder to work on the top. You were delivered by Wild in Art in a van and were here for a couple of months. You were too wide to fit through door into my studio so had to work on you in my conservatory as it has double doors that you could get through. Oh. Sorry about that! *ahem* … I hear that you once designed an owl as part of the Big Hoot in 2015. Why do you like to get involved in projects like this? These projects show that art is for everyone: displayed outside of the gallery and accessible to everyone and used to raise money for good cause. Your owl also had an X-ray theme. Why’s that? I have a background in medicine / healthcare as I was a radiographer. I moved to Birmingham to work at the MRI unit at the Royal Orthopaedic Hospital which at the time was the only NHS MRI scanner in the West Midlands. I subsequently went on to run the service. I also worked in the MRI scanner at the Queen Elizabeth Hospital. I previously lived in London and the south east. So you’ve created a bear and an owl… anything else? Yes – I collaborated on a piece of work about the Selly Oak Hospital with another artist and that now hangs in the main foyer of the Queen Elizabeth Hospital. I am starting a project with a surgeon and a patient group at the hospital next month. I have some work in an exhibition at St Pancras Hospital in London next month. I was also involved in an exhibition there last year. I was also shortlisted on two occasions (2014/2015) for the Shoosmiths Art Prize which was exhibited in Milton Keynes Hospital where they run a large and varied art programme. And finally… in no more than 141 words… how would you sum yourself up as an artist? My practice is an exploration of natural sciences through a multi disciplinary practice that includes drawing, photography, video, found objects and installation. Concepts stem from many aspects of natural science including current medical research and natural history. I combine these with the symbolism associated with vanitas and memento mori that includes skulls, butterflies, flowers and shadows to reference the transience of life and the fragility of human existence. I like to emulate the sense of awe and wonder associated with the cabinets of curiosities or wunderkammer that were first established in the seventeenth century in an attempt to categorise and tell stories about the wonders of the natural world, offering a strange link between ancient myth and scientific reality. I respond to the current relationship with the natural world which man seems determined to destroy whilst simultaneously recreating, cloning and deextincting. I’m catching up with Professor Asif Ahmed, Executive Dean of Aston Medical School, to find out why I’m here at Aston University. Professor Ahmed: Ed, Aston University has a long tradition of working with Birmingham Children’s Hospital for research and the care of young patients. Aston Medical School is the university’s newest School opening to undergraduates in 2018 and we are hoping to forge new links with the hospital. We love your health theme and the clever link between your name and that of John Hall Edwards who pioneered the use of X-ray in surgery over 120 years ago. Did you know he did this while working at the old Birmingham General Hospital, now the home of Birmingham Children’s Hospital? As a medical school we are wholeheartedly behind The Big Sleuth campaign because it engages everyone, is fun and inspirational. The public art trail is all about improving health and wellbeing through exercise and fresh air and spending quality time together with family and friends. We’re keen to promote positive messages that help tackle childhood obesity, early onset diabetes and social exclusion. The medical school also runs a widening participation programme – the Sir Doug Ellis Pathway to Healthcare – which gives local young people from disadvantaged backgrounds the chance to aspire to a career in medicine or other healthcare professions. You are, X-ray Ed! Through you we hope thousands of people will visit our city-centre oasis of a campus at Aston University over the summer and track you down to say hello and take photos of you to share with their friends. Ooh yes, I like pictures of me – and I’m giving prizes for my favourites. You can enter this Ed-citing competition by posting your photos of me on Facebook “Ed the X-Ray Bear” or Twitter “@EdTheXRayBear”. Make sure you use the hashtag #EdXRayBear. I’m not on Instagram, so just use the hashtag on those photos if you’re posting there. I’d love to see your photos of me – so much so I’m giving away prizes for the best ones! Each Monday I’ll pick my favourite photo posted the previous week and award a prize of either an Aston University or Big Sleuth bear. You just need to post photos of me on Facebook “Ed the X-Ray Bear” or Twitter “@EdTheXRayBear”, making sure you tag me and use the hashtag #EdXRayBear. I’m not on Instagram, so no need to tag me there, just use the hashtag. You can enter as many times you like; I’m on the Aston campus until mid-September. You can post selfies, photos of your family/friends with me, or photos of just little old me. I’d love to see any creative shots you make as well. I’ll announce the winner every Monday on my Facebook and Twitter pages. By using the hashtag you accept you are entering the competition and your photo(s) may be reposted. Winners will be contacted via social media and will have 24 hours to provide an address for the prize to be sent to. You may have noticed a stirring in the woods. Over the past week Shakesbear, The Honey Hunter and friends including Ed The X-ray Bear have popped up around us. It’s the time of year again that giant painted animals appear across the West Midlands, this year as part of The Big Sleuth art trail. 100 large bears and 137 colourful bear cubs have been placed around Birmingham, Solihull, Sutton Coldfield, Sandwell and Resorts World to create a huge route of discovery for all ages. Each of these sculptures tells its own unique story, whether it be raising awareness of Birmingham Children’s Hospital, the industrial heritage of the region or Aston University’s new Medical School, and over the summer we all have the opportunity to see some or all of them. Other events include a Fun Family 5K run at Sutton Park and “This Girl Can”, an event at Calthorpe Park which aims to encourage women and girls to get active. Alongside raising money for an important cause, this is a great opportunity for us all to be active this summer. The latest British Heart Foundation report suggests that more than a third of us are failing to reach even the minimum recommendation for physical activity each week, meaning around 20 million people in the UK are insufficiently active. Physical inactivity increases the risk of developing many diseases including obesity and heart disease and is the 4th most important risk factor in the UK for premature death. The benefits of exercise are numerous, and walking is a fantastic way to exercise. Walking can help you maintain a healthy weight, increase your fitness and even improve your mood or memory. For those amongst us who are feeling brave, collecting all the bears will involve walking around 70 miles, which in the average person would burn around 3500 calories. For those of us with a smaller appetite for bear hunting, there is a shorter, 2 hour walk around Birmingham City Centre, which will take in 23 bears and 3 clusters of bear cubs. Whatever your level of fitness or activity, why don’t you try getting out this summer and catching as many bears as you can, and at the same time getting some exercise at the same time. Dr James Brown is Senior Lecturer in Biology at Aston University’s School of Life & Health Science. He is a prominent media commentator on obesity, type 2 diabetes, frailty, cancer and ageing. How brilliant you are at clicking that mouse – it’s quite unbelievable that you’ve managed to find me this early. So I’m Ed… the X-ray Bear. The official Big Sleuth bear of Aston Medical School. And this Bear Log, or ‘blog’ as I believe they’re more commonly known, is a comprehensive guide to my daily activities. I will be giving regular updates of exciting events I’m involved with, sharing fascinating conversations I’m due to have with the University’s most prominent academics, and offering other facts and observations of mine which may give you a rare glimpse into the life of bears… specifically of the x-ray variety. It is quite simply… unmissable. Well yes, it is technically missable. But not if you follow my Twitter account where I’ll share all of my posts! So please do.